Pictured second from the left with his winning thesis Urban Campus is Warren van Niekerk of the University of Cape Town. 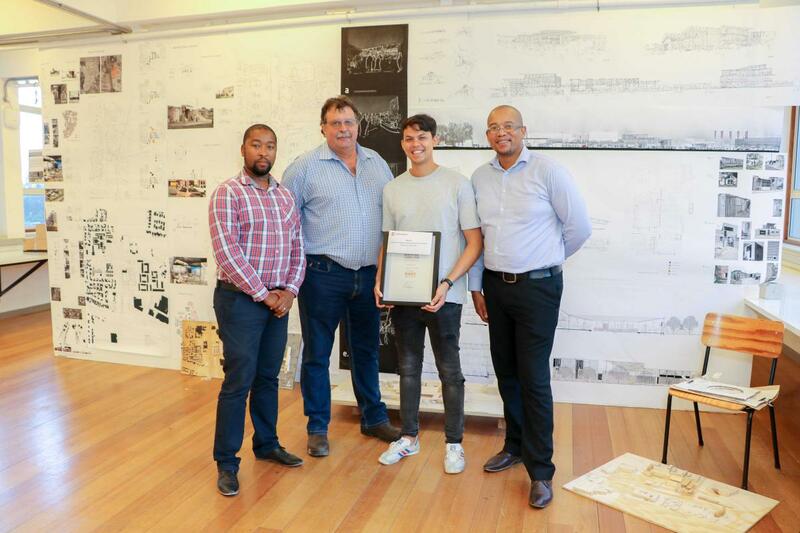 Warren van Niekerk will represent his university at the 2017 Corobrik Architectural Student of the Year Awards in Johannesburg in April 2018. He is pictured with from left: Similo Douglas from Corobrik, Christie Van Niekerk Corobrik Western Cape Manager, and Siyanda Mapekula from Corobrik. Sustainable architecture extends and complements the accepted building design concerns of aesthetics, cost-effectiveness, durability, function and comfort. If one defines sustainability as meeting the needs of present generations without compromising the opportunities of future generations then this means finding the balance between building homes and a sustainable environment. This was said by Dirk Meyer, managing director of Corobrik, ahead of the 31st Corobrik Architectural Student of the Year Awards, which are held every year to acknowledge and reward outstanding talent in South Africa. The competition begins with regional rounds at eight major universities throughout South Africa. Then, the overall national winner from among the regional finalists is announced and presented with a cheque for R50 000 at the Architectural Student of the Year Awards which take place this year in Johannesburg in May 2018. Van Niekerk says, “Delft is currently under construction. Evidence reveals that most residents have engaged in some form of building activity, be it small scale or large scale, self-initiated or by hired means. This labour-intensive condition gives rise to the notion of Delft as a site of production, resulting in an emerging local industry, which in return possess many opportunities both locally within and outside of Delft. In this regard, the dissertation explores how these building-related craft traditions can be supported, through the design of a vocational training urban campus in Delft. Thus far, building work has been executed within Delft in an ad hoc manner, and good building work remains unappreciated. The dissertation attempts to construct an institutional campus informed by the local vernacular that aids in the creation of a positive public realm and contributes to the civic. The components of constructing the campus are explored through three (building types) typologies that make up the various conditions as a whole; building as an edge of exchange, building as a thoroughfare and building as a yard. The building system adopted is deliberately clear and didactic in its making, revealing materials, joints, details and structure. The process of material selection and assembly is intended to echo the existing vernacular of Delft. The use of material such as clay brick work, concrete blocks, timber and steel are utilised, introducing new techniques and technologies of making, serving both a pedagogic and a development purpose. In second place Katherine Hall’s thesis is entitled ‘Sculpting Landscapes’ is the outcome of investigation, a building of many uses on Buitenkant Street, Cape Town. Hall proposes the is a building is a place to make pots from clay, a place to distil fynbos to fragrant oils, a place to live and a place to submerge your body in water and swim. The award for the best use of clay brick is given to Wesley Mitchell for the thesis entitled Phantom Narratives, a theatrical dining and performance space. The project, sited within the burnt-out building that once belonged to Madame Zingara, a Cape Town based Caberet restaurant, uses critical moments of the site’s history to inform its architecture. Phantom Narratives, a Theatre of Site Specific Memories becomes a device that captures the memory of the site while acknowledging its architectural and historical significance. The use of clay masonry, as a protective curtain wall enclosing the building, stems from the historical narrative of the site as being used for the fabrication of fired earth bricks as documented on an early 17th century map of the area. Mitchell says, “The brick forms part of a brick curtain system suspended away from the existing building's facade. This means that it leaves the existing facade as is, respecting its historical significance, while creating a protective skin along its perimeter that prevents driving rains, winds and summer heat from hitting the existing structure. This prevents any further deterioration occurring to the building. The curtain system is attached to a steel structure that sits along the interior of the building, meaning the facade system doesn't touch the building in its attempt to preserve it. Stepping the facade forward also means that from the street level, passers-by are able to see through the perforated brick curtain system into the interior of the building, offering a glimpse to the interior architecture of the building. This view of the interior is framed between the old facade of the existing building and the new facade of the intervention. Christie Van Niekerk said that developing more environmentally friendly construction practices was central to the concept of sustainable building and that one of the ways of minimising negative impacts was to specify low-maintenance and durable building materials like clay face brick with its light environmental footprint and low lifecycle costs. Christie Van Niekerk concluded that the winners in Cape Town regional round of the Corobrik Architectural Student of the Year Awards had shown commendable maturity, creativity and technical skill in their designs as well as a sound appreciation of the importance of sustainable building practices and, as such, were a credit to their chosen profession.